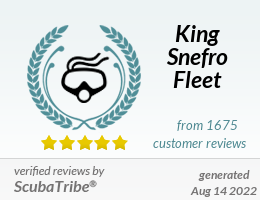 Built in Rashid and completed in 2012, King Snefro Fleet is expanding its range in the luxury class with Snefro Pearl. Unique in her style, the 27 m long and 7 m wide Snefro Pearl only accommodates up to 12 guests and is the alternative for smaller groups that wish to enjoy luxury liveaboard diving. At 33 metres in length Snefro Spirit is a twin engine, luxury liveaboard designed to meet all diver's needs. Built in Alexandria, she comfortably accommodates up to 18 guests in 8 twin berth cabins and a master suite on the upper deck. Snefro Spirit has a few added luxuries onboard, including an onboard sauna for non diving guest. Built in Rashid, measuring impressive 37 m in length, Snefro Love joined the fleet in 2010, she boasts with luxury that makes guests enjoying to be on board. All cabins are air-conditioned, with en-suite bathrooms, electronic safety deposit boxes, central music system and an internal telephone system. Also built in Rashid, measuring impressive 37 m, Snefro Target is of the luxury class boats within the fleet but the only one holding Area 1 & Area 2 license covering the whole Red Sea. Like with her sister vessel Snefro Love, there are 7 twin berth cabin, 2 double bed cabins and a master suite to welcome up to 20 guests. King Snefro 5 and her identical twin vessel King Snefro 6 were custom built in Alexandria / Egypt. The 22 m long and 6 m wide yachts are designed exactly the same way. With a major refit in 2011, each one accommodates up to 10 divers. Enjoy diving in small groups, King Snefro 5 is also ideal for smaller groups looking for a comfortable full charter boat to dive the best sites of Sinai. King Snefro 6 and her identical twin vessel King Snefro 5 were custom built in Alexandria / Egypt. The 22 m long and 6 m wide yachts are designed exactly the same way. With a major refit in 2011, each one accommodates up to 10 divers. Enjoy diving in small groups, King Snefro 6 is also ideal for smaller groups looking for a comfortable full charter boat to dive the best sites of Sinai.